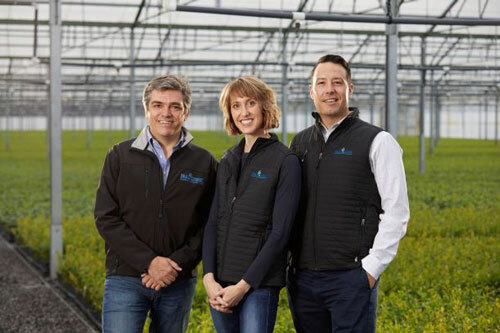 Oscar Verges, president & chief operating officer, Amelie Brazelton Aust and Cort Brazelton, co-chief executive officers at Fall Creek Farm & Nursery, Inc.
Fall Creek Farm & Nursery Inc. has announced a leadership transition in the family-owned, Oregon-based, globally reaching blueberry plant breeding and growing company. Current CEO Dave Brazelton will become executive chairman of the company’s board of directors, while his son and daughter, Amelie Brazelton Aust and Cort Brazelton, will assume co-CEO positions. Oscar Verges will serve as president and chief operating officer of the company. All of these changes will take effect January 1, 2019. Wolfram noted that Fall Creek’s new leadership will need to develop strong regional teams to successfully manage at the global scale. “There is a lot of added value with their three perspectives and diversity of talents, so the team is poised to meet these challenges,” he said. Amelie Brazelton Aust joined Fall Creek in 2008 to manage the company’s intellectual property and licensing activities. Currently serving as interim director of product development and global commercialization, she focuses on the company’s licensing strategies for positioning its genetic developments in commercial blueberry varieties. Cort Brazelton is the current director of business development and interim director of sales for Fall Creek’s European business. Before joining Fall Creek in 2008, he was the blueberry business manager for Driscoll’s and principal of Brazelton Ag Consulting. Oscor Verges is the current COO of the company with a background in international business and produce industry experience. In 2007, he helped develop some of the earliest blueberry plantations in Morocco with fruit producer and marketer Royal Natural of Barcelona, Spain. Dave Brazelton co-founded Fall Creek 40 years ago and will continue to advise the company through the privately-held global company’s board of directors. Fall Creek Farm & Nursery, Inc., is an international blueberry breeding and nursery company with nursery operations and research and development centers in the U.S., Mexico, Peru, Spain and The Netherlands. The company was founded 40 years ago by Dave and Barbara Brazelton in Lowell, Oregon. Fall Creek breeds and delivers blueberry varieties, nursery stock and grower support to commercial fruit growers throughout the world. For more information, log on to www.fallcreeknursery.com.